What Is an Alienation Clause in Real Estate? 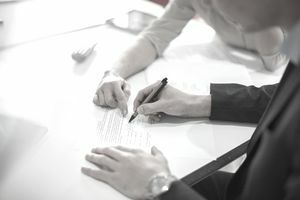 An alienation clause is language in a mortgage or trust deed that allows the lender to call the loan immediately due and payable in the event the owner sells the property or transfers title to the property. Almost every loan today contains an alienation clause, which means title cannot transfer and a buyer cannot purchase subject to an existing loan without triggering a due on sale clause. "In the event the Property or any part thereof or any interest therein is sold, conveyed or alienated by the Trustor, whether voluntarily or involuntarily, except as prohibited by law, all obligation secured by this instrument, irrespective of the maturity dates express therein, at the option of the holder hereof and without demand or notice, shall immediately become due and payable." It is practically impossible to find any existing mortgages today that do not contain such a clause. While it might not be stated verbatim, the alienation clause prohibits the transfer of real property without paying off the existing mortgage. Way back when creative financing was extremely popular during the late 1970s and early 1980s in the United States, especially in California, real estate agents often spoke of the 1974 court case, Tucker v. Lassen Savings and Loan. This was a landmark court case involving an installment land sales contract. It basically said the lender did not have the right to call the loan due and payable because it could not prove its security was damaged upon transfer of sale in a land contract. Many real estate agents during that period of time put together creative financing transactions in which the buyer acquired equitable title via a land contract and paid the underlying mortgage, in addition to making payments to the seller for the seller's equity. It was high-interest rates that pushed buyers to rely on creative financing. Fast forward to the 1978 court case of Wellenkamp v. Bank of America. This second landmark California court decision solidified what Section 711 of the California Civil Code already stated, that a lender could not enforce an alienation clause by calling the loan due and payable if the security for the loan was not impaired or in danger of being impaired. After that, many homes were selling subject to a mortgage left and right, like there was no tomorrow, side-stepping the 18% interest rates that were so prevalent. It was very common to close a transaction back then in 7 days. Buyers were putting down 7% to 10% of the sales price, enough to pay commissions and closing costs, taking title subject to mortgages and executing carryback financing to the seller in the form of a second or third trust deed. In some ways, it was like the Wild West. Agents who understood creative financing moved a lot of inventory, and the Get Rich Quick seminar business was born. Suddenly, creative financing seminars were ubiquitous. This was new territory for many real estate agents and their clients. It was also a ripe climate for abuse and fraud. After the 1982 Garn-St. German Act, much of the creative financing schemes slowly came to a halt. Even the lease option sales, created and structured as a loophole to the alienation clauses, came under fire. In the following years, interest rates began to decline, making obtaining a new mortgage an attractive option for first-time home buyers. This put conventional loans and FHA loans back into action. There were still a few old FHA loans that could be taken over without a formal assumption, but as the years went on, there were fewer and fewer of these loans available. Today, there is none. Of course, part of this resulted in the 80 / 20 combo loans that partially contributed to the Subprime Market Crash in 2007. Buyers who could fog a mirror, without the ability to repay a mortgage, were allowed to take out 100% financing. We all know what happened when the market crashed in 2008. Today's mortgage requirements are much stricter, and it's a lot more difficult to get a mortgage now. Are Online Auction Sales Legally Binding?